1. 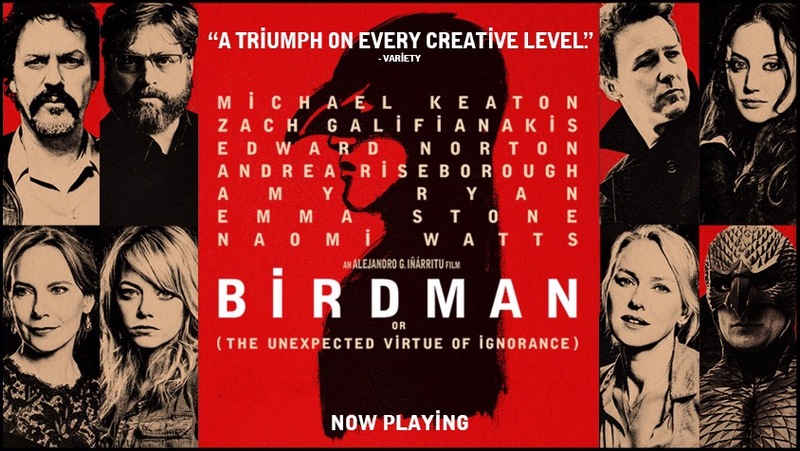 Birdman – A unique and refreshing mindf*** of a movie. So entertaining and so fun with possibly too many endings. 2. Calvary – Oh man, this one rips you apart. But it’s so funny. Hard to shake it off. 3. Grand Budapest Hotel/The Lego Movie – Definitely two of the most fun movie watching experiences of the year. I cannot believe The Lego Movie wasn’t nominated. 4. Whiplash – This one was fun (and stressful) for different reasons. Fun in the way that you might get enjoyment by seeing a jerk fall down a very hilarious set of stairs. 6. Inherent Vice – Once I stopped trying to figure out what the HELL was going on I enjoyed it a lot more. 7. Boyhood/The Theory of Everything – One is a great movie with so-so acting and the other is a so-so movie with great acting. 8. The Imitation Game – Once a year I am caught off guard by a movie that I end up loving that I had no desire to see. And usually Keira Knightly is in it. 9. Nightcrawler/Blue Ruin – Both incredibly well made and extremely disturbing. But they certainly keep you on the edge of your seat the whole time. 10. Dawn of the Planet of the Apes/Willow Creek – Both are well made and fun B-movies about monster apes in Northern California. 1. American Sniper – Ugh. The more I think of this one the more I actually despise it. Might as well have been called “GI Joe 3” or “Captain America: Iraq Soldier”. It certainly should not have been called a true story though it’s true that there was a sniper named Chris Kyle. If you want a much more interesting story then read the book, though that’s hard to recommend too. 3. Snowpiercer – Not so much terrible as just over hyped. WAY too overhyped. 4. Transcendence – Ok this one actually was a bad movie. Or at least the first 45 minutes were bad. I couldn’t be assed to finish it and that says something. 5. Godzilla – For future monster movies can we just stop writing scripts or letting humans talk? Just let the damn monsters fight. Also, maybe actually showing Godzilla a little more would have helped.